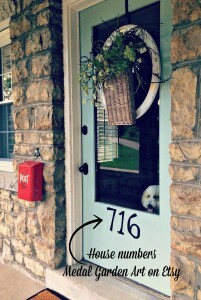 I often say that 716’s front porch – is the best seat in the house. 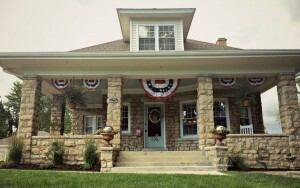 Nothing says Americana more boldly than a front porch. In many ways our porches in America represent a cultural ideal of family, community, and a bridge between the outside world to our living rooms. 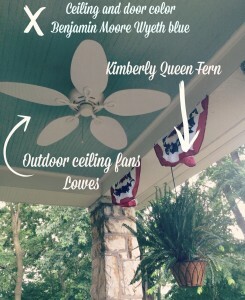 As we prepare to celebrate this great nation – I thought I would share some of my favorite parts of our front porch. Welcome…come sit for a while. 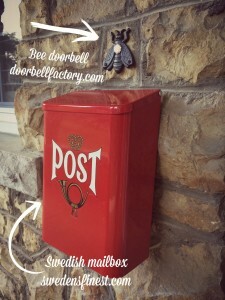 To pay homage to Mr. 716’s fine Swedish stock, I added this fabulous mailbox. These charming mailboxes can be found all over Europe. 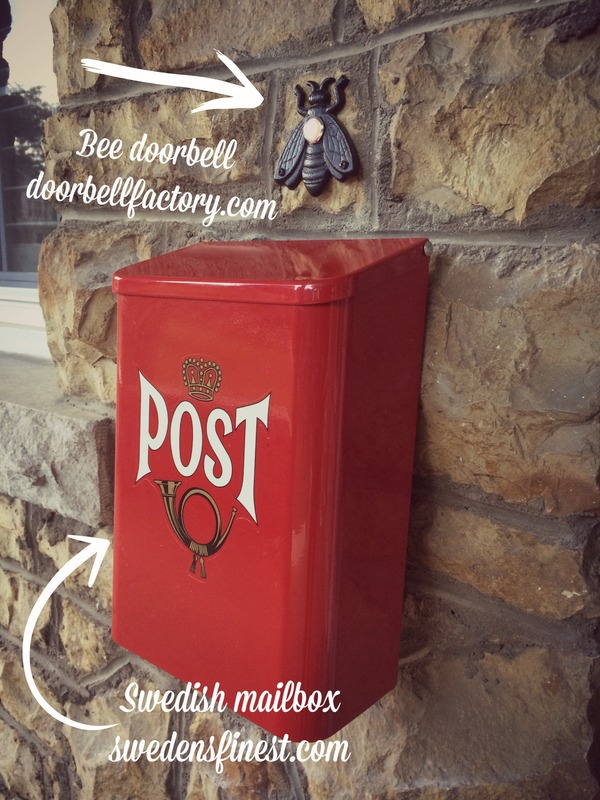 Lillian Vernon sold this style of mailbox for years and the vintage revival is renewing their popularity. We cannot forget the doorbell. Bees have long been a symbol of a family working together for the benefit of the group – the hive. 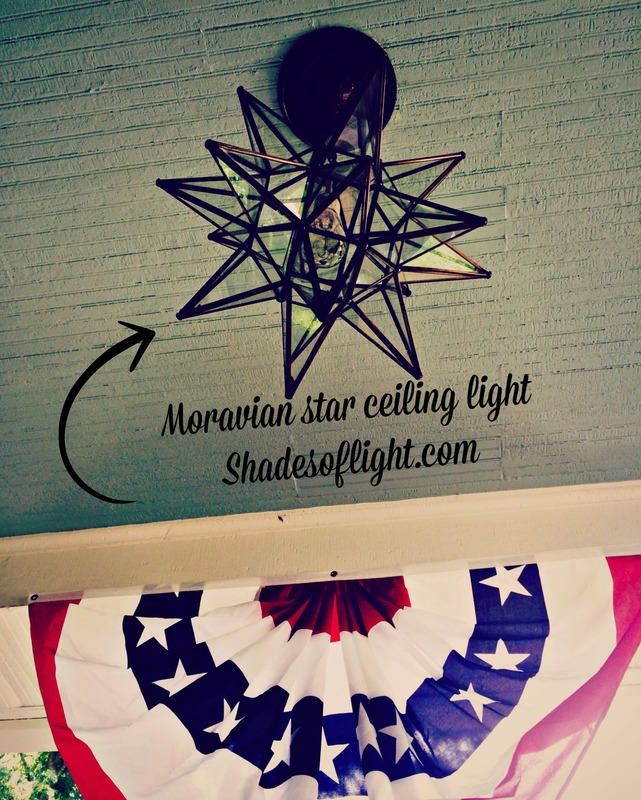 Moravian stars are a European tradition dating back to the 19th century. Stars like this one were once displayed in windows in the days leading to Christmas. Its geometric form provides a whimsical touch for the porch. There is something elegant about ferns on the front porch. They are inviting and add a touch of natural color and texture. Our Midwest porch faces South and the moody Boston Fern would be no match for the Missouri sun. My solution – the Kimberly Queen fern. These ferns are tidy, adaptable and compact – a great solution for many porches. Got haint? Some Southerners claim that Haint (a low country spirit or ghost) could not cross water. Many a Southern porch ceiling was painted “haint blue” to ward off bad spirits from entering the home. Others claim that a blue ceiling works as a bug repellent – claiming insects will not nest on blue as they confuse it with the sky. Here a 716, we’re not taking any chances. Any comfortable room deserves good seating. 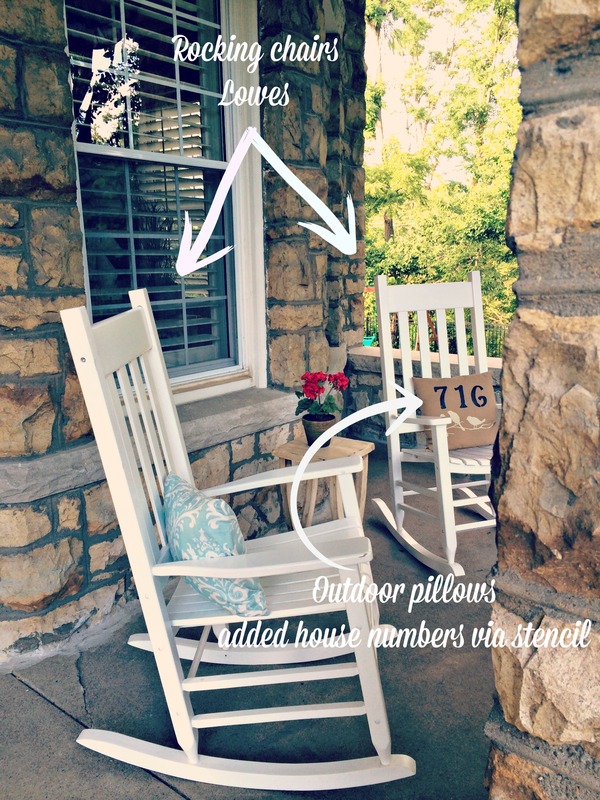 In addition to a porch swing, we added two all weather rockers perfect for gossip and sweet tea. 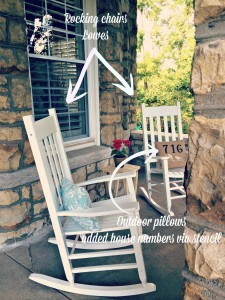 I purchased a some standard outdoor, all weather pillows and added 716 with a stencil. That delicious, Midwest sun that refused me Boston Ferns – also did a number on my annuals planted on our front porch each year. This year I officially broke up with the idea that planters were only for annuals. I have moved on – and have never been happier. 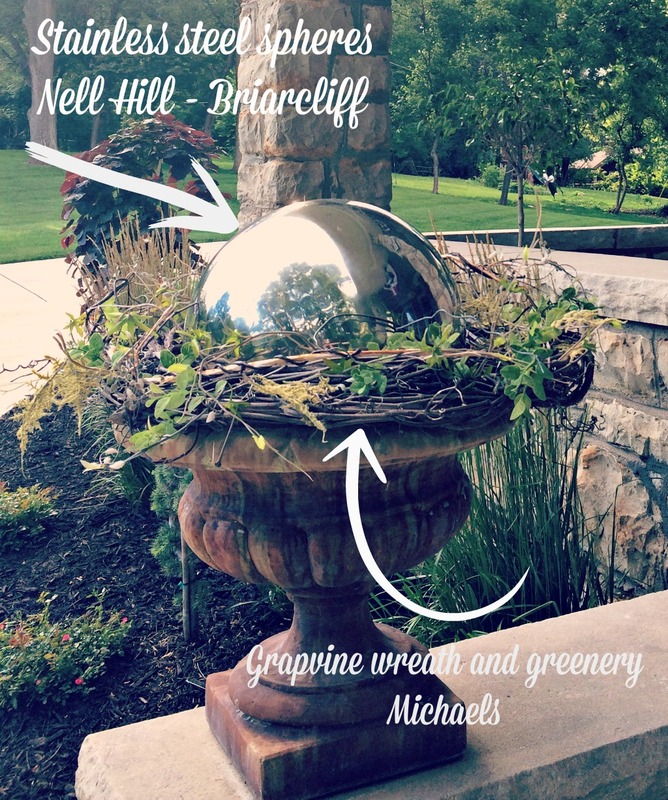 These stainless steel spheres from Nell Hills Briarcliff work to perfectly frame our steps. The bonus – summer rain sounds fantastic against their steel. Porches literally connect our homes to the outside world. This weekend celebrate old school and nostalgia with a beverage of choice on your front porch. This might be my favorite post yet. I have many great memories from the porch at the farm. So happy to see you doing what you love! 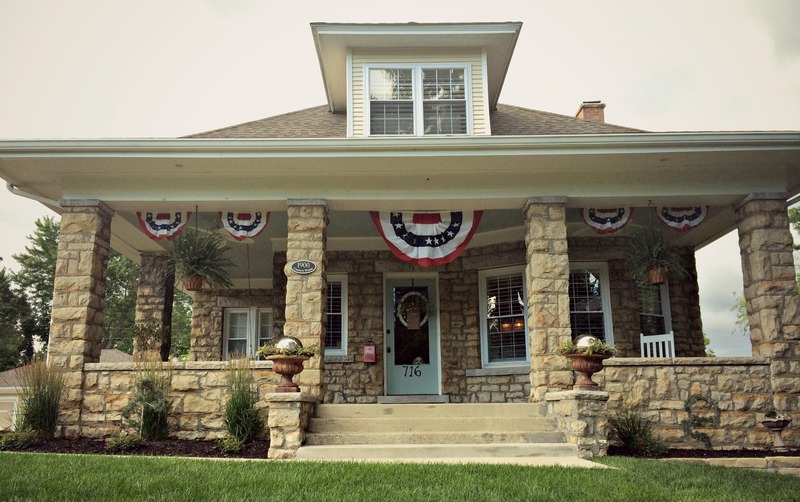 716 is truly a home with character, style and charm. Congrats!! Love this post! What a beautiful front porch! I love all the background information on all the decor, very interesting. Thank you Dana…lets plant ourselves there sometime this weekend! You need to come back Michelle Grace…we will sit on the porch and then in the pantry! I love how much thought went into every detail – I have so many pieces in my home that tell a story … that’s what truly makes a house a home. Beautiful!! Thank you so much Megan…I appreciate your feedback…I couldn’t agree more…its really those details that make our surroundings wonderful! I love your porch! My porch faces west and gets a lot of sun exposure through the summer months. Because of this I have to refinish my wood porch floor planks yearly. What do you do with your porch floor? Thanks for the tip on the fern – I have never heard of the Kimberly Queen Fern…I will look for those next year. My Boston ferns require daily watering or they fizzle quickly! Too much work! Thank you so much Stephanie…you need one of those Swedish mailboxes asap!!! Great blog! We had the great joy of seein Mavis enjoying the porch while we drove by on our way to in laws just th either day! Love your ideas…especially the planters!! I am planning to do something different next year because I’ve not enjoyed being a slave to a few bucks worth of annuals! !